Years ago, when I was single, often I worked overtime. I’d have a plate lunch, and after a 12 hour day, go back to the flat and look for something quick, easy, nutritious, and of course, tasty to eat. What soon became a twice weekly meal were ramen noodles. They were very inexpensive and quick to prepare. But tasty was another story. By themselves they were just a salty liquid with noodles. One way to cut the salt was to add vegetables. I bought some 16 oz bags of frozen broccoli, cauliflower and carrot mixture, and after some experimentation, I came up with a tasty dish. Here is how to doctor up ramen noodles, with the wonderful benefit of eating more than enough fresh frozen vegetables. This could be two servings, but even if you eat it all yourself, it’s still only about 300 calories, although light on protein. But, if you ate enough protein during the day, this complex carbohydrate meal is perfect for your supper. Put one cup of water in a pot. Turn on flame and add the soy sauce, sesame oil, onion and garlic powder and 5 spice powder, if using. 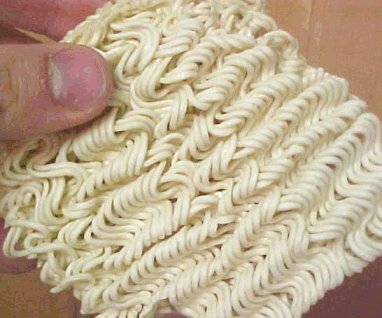 Before opening the noodles, break in half and then break each half in half. Add the contents of the flavour envelope, stir, and add vegetables. Cover and bring to boil, then boil uncovered about 3 minutes. Add the quartered noodles and stir well to fully immerse. Boil 3 minutes and serve.